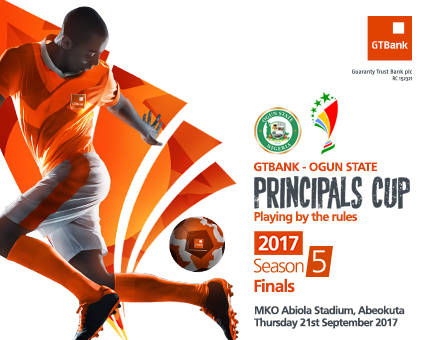 The 2017 edition of the GTBank-Ogun State Principals Cup will reach its climax on Thursday 21st September, 2017 at the famous MKO Abiola Stadium, Kuto, Abeokuta. The highly anticipated finals will thrill football lovers from across Ogun State and beyond as first-time finalists take on former champions. The curtain raiser for the day will be the finals in the female category between two time winners, Muslim High School, Isolu and Iko Gateway Grammar School, Idiroko. In the male category, Ipara Community Secondary School, Ipara will hope to spring an upset as they take on title favorites, Pakoto High School, Ayede-Ifo who won the trophy in 2015. The matches are bound to produce historic moments for two of the four schools as both jostle to win the trophy for the first time ever. The GTBank – Ogun State Principals Cup has been won by five schools since its inception. In the male category, Alamuwa Grammar School, Ado Odo won the first and forth editions of the competition (2013, 2016) and are the only male team to win twice so far – a feat Pakoto High School hope to repeat when they file out on Thursday – while Remo Divisional High School, Sagamu emerged winners in 2014. In the female category, Orile Ilegun Comprehensive High School, Odeda clinched the title in 2013, Alamuwa Grammar School, Ado Odo 2014, while this year’s finalist, Muslim High School, Isolu took home the title in 2015 and 2016. Outstanding players to watch out for in the male category of this year’s final include Olalekan Toheeb of Pakoto High School who is the leading scorer of the tournament with three goals, and Sodiya Olaoluwa of Ipara Community Secondary School who won the most valuable player award in the semifinals. In the female category, all eyes will be on Adeyanju Hanna of Iko gateway Grammar School who scored the lone goal that earned her team a place in the final, and Kayode Tolulope of Muslim High School whose midfield prowess helped her team get to this stage of the competition. Winners in both categories will be rewarded with the sum of N1,000,000 each, while the 1st ,2nd, 3rd runners-up will be given N750,000, N500,000, and N350,000 respectively. He further stated that “This competition paves the way for youths to cultivate their sporting talents and aptitudes, while fostering and building a healthier lifestyle at a critical stage in their lives”. Guaranty Trust Bank plc is a foremost Nigerian financial institution that has maintained a defined Corporate Social Responsibility (CSR) strategy since its inception in 1990. The Bank actively supports in-classroom and out-of-classroom educational programmes, infrastructure development, students’ scholarship and teachers training across Africa. Alongside the Ogun State Principals Cup, GTBank also sponsors the Lagos State Principals Cup, and the Masters Cup tournaments.